One client posed a problem he was having with his current toilet block / shower extraction system. His current ventilation system or replacing air system provided high indoor air quality (i.e. to control temperature, replenish oxygen, or remove moisture, odours, smoke, heat, dust, airborne bacteria, and carbon dioxide). Like traditional ventilation it is used to remove unpleasant smells and excessive moisture, introduce outside air, to keep interior building air circulating, and to prevent stagnation of the interior air. This is the perfect option for a Toilet / Changing room, BUT it removed heat from the building while venting out. 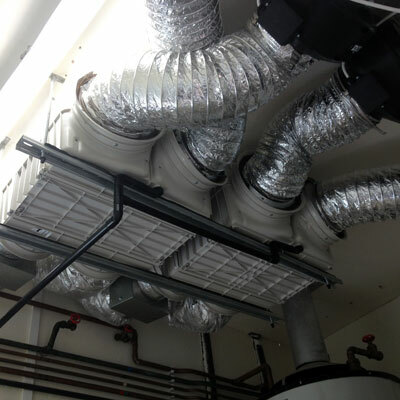 The solution we offered was to install a Heat Exchange System or HEU this traps the heat while it is being extracted out and adds it to the air being brought into the building. Reducing the amount of heat lost. In this particular system 70% of the heat was brought back into the shower / toilet block. Meaning very happy and warm campers!